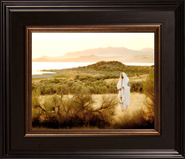 This Scott Sumner canvas giclee photograph evokes what can only be described as a spiritual experience. The light captured in this piece gives new meaning to the phrase Light of the World. As Christ stands on the edge of the rocks, Scott Sumner uses the symbolism of a light house, a light used to traverse rough waters and reefs to make it into the safe harbor. Invite the spirit into your home with this photo representation of the light of Christ. The art work and the use of light evokes an emotional awakening of a spiritual nature. If one has traveled to the roads where Christ once walked you can't help but be drawn to this work of art. I would recommend this artwork to grace any home.